Well, it had to happen sooner than later, I am driving east. I left Palm Springs on Sunday (4/3) after spending Saturday at a pool party which was not anywhere as much fun as I had hoped. Hobbling around a pool party is never fun. Even the dinner at a nice restaurant was only half good. Why can’t restaurants prepare tuna correctly? If you order medium rare there should be red or at least pink in the middle of the piece and not brown. Never mind that it should not taste fishy. At least the restaurant didn’t charge me for the dinner. 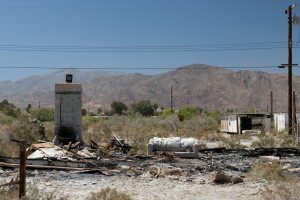 I had been in the Palm Springs area around Thanksgiving and lots of places looked familiar, except the gas prices. Regular had gone up $1.04 per gallon in just over four months. California is just too expensive; $4.15 for regular was not even the highest. Glad I filled up for a mere $3.95. 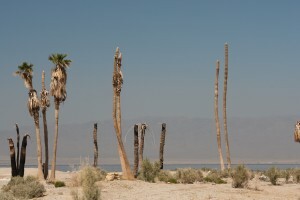 Since I had been here before I chose to drive along the western instead the eastern side of the Salton Sea. Unfortunately, the sea and communities along its shores don’t look much better on this side either. If you read my previous post about the Salton Sea you might remember all the dead fish on the beach. I didn’t see any dead fish this time, but lots of destroyed communities right at the edge of the sea. A little further inland you could find homes with nice front yards, but the whole area felt very depressing. Even the desert to the west of hwy 86 seemed not as alive as in other places. As so many times before, things can change very quickly. Just a bit south around Westmorland, the desert was replaced by huge fields of green; wheat, lettuce and other produce. Along the northern parts of Alt-86 orange trees were full with oranges ready to be picked. I stayed at the Wiest Lake campground. The smallest lake I have ever seen, but people still rode their big motorboats in tiny circles. What I hadn’t expected were the feeding lodges across the street. Between the aroma of cow manure and the flies, this was not the best camp spot, but it was quiet. It was a state park, there was no ranger, no pay box and no rates posted. Got to love these places. Office closed for the weekend. I hoped to see someone in the morning, no such luck. I left a note and money; I had only used water, no electric. In the morning I headed east on hwy 78. Passing the great Imperial Sand Dunes and than thru the desert, where some of the cacti have started to bloom, to the oh so wonderful interstate to Yuma, Arizona. 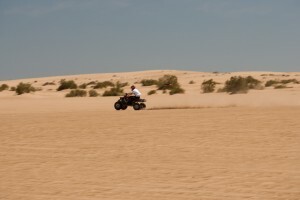 I didn’t spent much time in Yuma, just gassing up and getting some groceries. Since my leg is hurting too much when I walk, I can’t explore any of the places I pass through, which really stinks. I dry camped near the town of Wellton between some fields. They are a little strict about parking campers on the street around Southern Arizona. 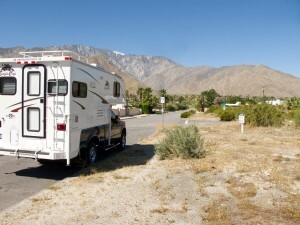 There are too many snowbirds in the winter time and the place is just overrun with RVs. I always try to avoid the interstates as much as possible and sometimes that leads me to some interesting dirt roads. 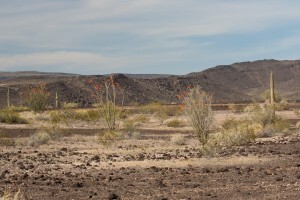 Driving along cultivated fields, followed by desert, followed by areas covered in volcanic rock (my favorite 🙁 ) sprinkled with great saguaro cacti. You just never know what you might see. I just found out that my tenant will stay until August, which means I’ll be on the road for an additional two months, yeah!